Michael is a Non-Executive Director of Opteon. 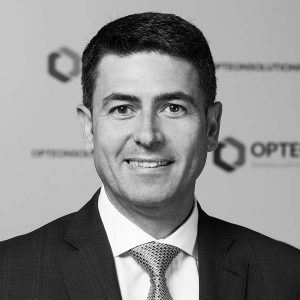 Michael was Chair of Opteon August 2015 – February 2019 and was instrumental in Opteon’s transformation to an integrated business. With 27 years of senior management experience, Michael possesses a strong understanding of international markets, strategic management, M&A and profitable growth at the Board, CEO and Senior Executive level. Michael is also on the global leadership team of AECOM, the world’s largest engineering firm with annual revenue exceeding US$18b. He was formerly CEO and Head of International Operations of Cardno, an ASX200 engineering, environmental and management services company and previously provided executive consulting services to private equity and corporations in US, Canada, Australia and Africa. Michael’s global experience spans technology, oil & gas, mining & resources, transport & urban infrastructure and construction. Michael holds a Bachelor of Business (Hons) and is a graduate of the Advanced Management Program from Harvard Business School.